In hopes of encouraging energy efficiency and affordability in apartment properties and strengthening the market for green investments, a new Green Rebate is now available to borrowers on qualified property loans who voluntarily provide an ENERGY STAR® score with their loan documents, This rebate is offered by Freddie Mac. Rental housing is home to a majority of the nation’s lower income households who work hard and are struggling with housing costs such as rent and utilities. Freddie Mac also plans to eventually report the ENERGY STAR scores in its K-Deal multifamily mortgage-backed securities and is encouraging industry adoption of the tool. The ENERGY STAR Score is available in the EPA’s Portfolio Manager® tool, a free online software platform that allows commercial building owners and managers to benchmark and track energy and water usage as well as greenhouse gas emissions. More than a dozen cities and counties across the country, including New York, Chicago, Boston, San Francisco and Washington, DC, require energy tracking and reporting using Portfolio Manager. The EPA estimates that the average commercial building wastes 30 percent of the energy it consumes, often resulting in higher operating costs. If a 400,000 square-foot building pays $1 per square foot in energy costs, then cutting its consumption by 10 percent adds $40,000 to its net operating income, and could boost the property’s value by $800,000 assuming a 5 percent cap rate. The EPA’s Portfolio Manager tool is the industry standard for energy, water, and greenhouse gas benchmarking, with over 400,000 properties representing more than 35 billion square feet of space using the tool. More information on Portfolio Manager can be found at www.energystar.gov/benchmark and information on the ENERGY STAR Program for multifamily properties can be found at www.energystar.gov/multifamily. For more real estate information, including a FREE Home Market Analysis and Market Area Statistics, please contact me at 866-977-7623. Selling your home can seem a daunting task. When you close that deal, you want to make sure that your home goes to the best buyer for the best price. It may seem cheaper to sell your home yourself, and many do; however, there are a lot of details to work through. “Selling your home through a REALTOR® can help you make sure you get the best value overall,” says Kimberly Nicole, a REALTOR® based in The Woodlands/Houston, Texas metro area who caters to luxury homes and their clientele. 1. REALTORS® Know How to Navigate the Process – A REALTOR® is the manager of your home buying process. Nicole explains that you and your REALTOR® will begin with extensive discussions to head off any road blocks later on. Your REALTOR® is aware of your concerns, needs and priorities. They are there from the beginning to end, navigating each step of the way with you. Selling real estate can be a tricky business, full of regulations and involved steps. Your REALTOR® works for you, staying on top of the latest regulations and helping you meet them. 3. REALTORS® Know How to Prepare Sellers – Before you sell, your home must be in the best condition possible. Your REALTOR® can advise you on what repairs need to be done, and they frequently know good contractors. You may have to have inspections done before you sell, and will probably have to do repairs. A REALTOR® can set up any required inspections and instruct you on how to prepare. Sometimes homeowners will take out a loan against the house to finance costly repairs, but this can’t be done while the house is on the market. A REALTOR® may help assess the situation, and then wait to list it until the repairs are completed. 4. REALTORS® Can Help Sellers Prepare for Showings – “Staging is extremely important,” says Nicole. “That first impression is vital.” Not only do all of the repairs need to be done, but if you still live there, the place must be kept clean and staged. This means everything from maintaining curbside appeal to the little details, like placing out a plate of cookies or laying out your best dishes in a table setting. She advises that a home must be open and inviting, and that smells, pets and lighting must all be taken into consideration. “We don’t want a home not selling because a buyer can’t see their own furniture in the home.” Your REALTOR® may also advise you to de-clutter certain closets and rearrange rooms. They may explain which personal touches add a “homey” look and which things detract from a potential buyer envisioning their own decor. 5. REALTORS® Can Help Get Buyers Through the Doors – REALTORS® not only get the traffic in, they know how to manage it. They can arrange and hold open houses in a way that gets as many visitors as possible. They also work with buyers so that showings are more convenient for you. This is especially important if you still live in the house. REALTORS® may also help weed through potential candidates so that you don’t waste your time with no-shows or non-serious buyers. “If a person needs to sell a house before buying another, the seller needs to know this,” says Nicole. This all factors in to final decisions and net proceeds. 6. REALTORS® Know How to Objectively Negotiate – You may think preparing and showing your home may be stressful, but receiving offers can be difficult. “The goal is to get the most money as the seller, and as the buyer the goal is to look at market value and if it’s priced appropriately. You don’t want to present an offer that’s an insult to the seller,” says Nicole. A REALTOR® can help you stay reasonable, without letting you take a lowball offer either. They will also be there to navigate a multi-bid and renegotiations. “Renegotiations fall apart all the time, and deals frequently don’t come through,” she says. “Each side has different concerns, and each party needs to know where the other stands.” Closing can be a confusing process, and there is a lot of paperwork to sign. Your REALTOR® has been through this many times and can explain everything you are signing and why. If you have any questions on anything, your REALTOR® is right there. 7. REALTORS® Know the Area – “The key to a good agent is knowing the area,” says Nicole. They know what the property values are, and have a good idea of future market fluctuations. They also know where and how to list your property for best results. Having a home listed on MLS is not enough. A good REALTOR® that is knowledgeable of the area is essential to getting the best deal on your home. This post was originally published on RISMedia’s blog, Housecall. Check the blog daily for real estate tips and trends for you and your clients. September’s cool winds are just around the corner. Below are a few home maintenance tips to smooth your transition from summer to fall. Service your systems. Checking your furnace and changing your furnace filter before the cold creeps in will put you ahead of the game. Make an appointment with a professional to have your heating system tune up. Freeze-proof your faucets. The mere mention of a busted water pipe is enough to make any homeowner cringe. The pipe that is most likely to freeze is your outdoor faucets for hoses and sprinklers. To avoid cold-weather damage, install a freeze-proof faucet and sleep soundly. Weather-proof those windows. Solidly sealed windows will help control your home’s temperature. When is the last time you checked your window’s weathering? Before fall, weatherstrip and caulk your windows to keep the cold air out and the warm air in. As soon as the temperatures begin to drop, replace those breezy summer drapes with heavier versions to keep your living space cozy until spring. Clear gutters. It’s best to clear out your gutters at the change of every season. Before fall begins dropping its leaves, give your gutters a purge. Sweep that chimney. Do you have a working fireplace? If so, it’s best to have a professional chimney sweep come take a look to make sure you don’t have any dangerous build up that could cause damage when you strike that first match come fall. To see other recent Harris Polls, visit TheHarrisPoll.com. For more real estate information, including a FREE Home Market Analysis and Market Area Statistics, please contact us at 866-977-7623. 1. Cost – According to U.S. Department of Energy estimates, the average family spends $400 to $600 each year on water heating costs, and as an older unit ages, its efficiency continues to erode. Rising water heating costs year after year could be a sign that it’s time to replace your unit. By switching to a new energy-efficient water heater or a new energy source, you could save hundreds of dollars each year. 2. Lifespan – Most water heaters should be replaced every 10 to 12 years. To make the right choice for replacement, you should factor in the annual cost of ownership, which is the cost of original equipment, installation and expected annual energy costs divided over the unit’s lifetime. 3. Carbon Footprint – Upgrading to a newer, more efficient model means reducing your carbon footprint. Compared with standard efficiency electric storage tank models, propane produces two times fewer emissions. The difference amounts to about 1,300 pounds of carbon dioxide a year, the equivalent of driving a car more than 18,000 miles. Homeowners with poor credit pay exactly twice as much for homeowner’s insurance as people with excellent credit, and homeowners with median credit pay 32 percent more than those with excellent credit, according to a new insuranceQuotes.com study. People with poor credit pay at least twice as much as people with excellent credit in 38 states and Washington, D.C. West Virginia’s 202 percent increase is the highest in the nation, followed by D.C. (185 percent), Ohio (185 percent) and Montana (179 percent). Three states prohibit insurers from using credit to calculate homeowner’s insurance premiums: California, Massachusetts and Maryland. Insurance companies are technically allowed to consider homeowners’ credit scores in Florida, but insuranceQuotes.com found that credit does not typically affect premiums there. The greatest differences between excellent and median credit were observed in Montana (66 percent), Washington, D.C. (61 percent) and Texas (55 percent). More information, including the results from all 50 states and Washington, D.C., is available here. 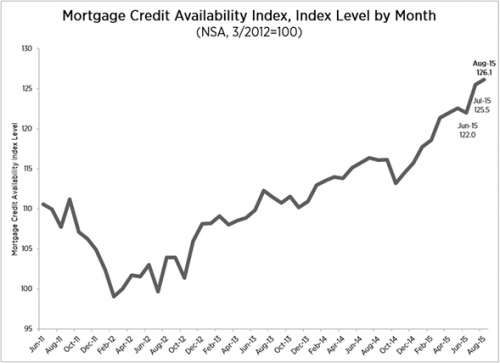 Recent news shows that mortgage credit availability increased in August, moving 0.5 percent to 126.1, which suggests a national loosening of credit. This news comes from the Mortgage Credit Availability Index (MCAI), a study from the Mortgage Bankers Association (MBA) which reports that the index was benchmarked to 100 in March 2012. Of the four component indices, the Jumbo MCAI saw the greatest loosening (up 0.7 percent over the month) followed by the Conventional MCAI (up 0.5 percent), the Government MCAI (up 0.4 percent), and the Conforming MCAI (up 0.3 percent). For more information, visit www.mba.org.